This is our Multi-functional baby highchair.It can not only be transformed to a traditional dining chair for babies, but also a chair with rocking horse function ( great fun! ) --- You only pay for one but get THREE functional furniture for your baby! Regular tray and removable, dishwasher safe insert tray. Removable tray includes a cup holder and large main compartment. Main tray features one spacious, indented compartment. For use from 6 months (when your child can sit unassisted) and up in the highchair, and approximately 4 years when converted to a play table and chair. When you want to change the position of your baby, no need to push this high chair painfully. Just adjust the lock on the wheels and you can move this high chair at ease. Then lock it again if you want to keep your baby safe! Made of safe material of PP and fabric , this high chair can not only be transformed to a traditional dining chair for babies, but also a chair with rocking horse function ( great fun! ) --- You only pay for one but get THREE functional furniture for your baby! The seat has 3 positions to be adjusted--- your baby can sit on it comfortably with the angle of inclination they like. Besides, the 5-point safety restraint system can also protect your baby very well. The tray with cup holder and large main compartment is removable---you can wash it easily by remove it from the chair and then install it back without efforts. Four lockable wheels on the table--- When you want to change the position of your baby, no need to push this high chair painfully. Just adjust the lock on the wheels and you can move this high chair at ease. Then lock it again if you want to keep your baby safe! 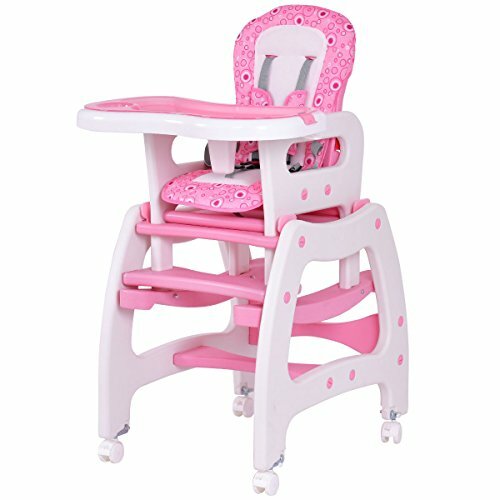 A nice high chair for your baby! Overall Size: 19.5" x 25" x 43.5" (L x W x H), Suitable for kids from 6 months to 6 years old, Assembly required.